Do you want your music to be put in front of thousands of music fans from around the world straight away? If so this service is just for you. Since HouseMusicPodcasts launched 3 years ago we are recieving over 1million hits on our website every month, and have exceeded 3million podcast downloads. Your tracks and podcasts will also be posted on our Twitter and Facebook pages 🙂 Do you want to be part of this now?? To add a track or podcast to our website is really simple! There are a few steps you need to take before submitting your music. 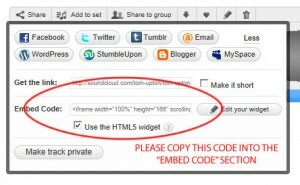 Please Note: To use this feature on our website you must have a SoundCloud or MixCloud profile, with the “Embed Player” option enabled. Purchase a subscription package. We have kept the submission subscription prices nice and cheap just for you! Visit the Track / Podcast Submission Page and Submit your material. All submissions will be automatically posted straight away on our website!